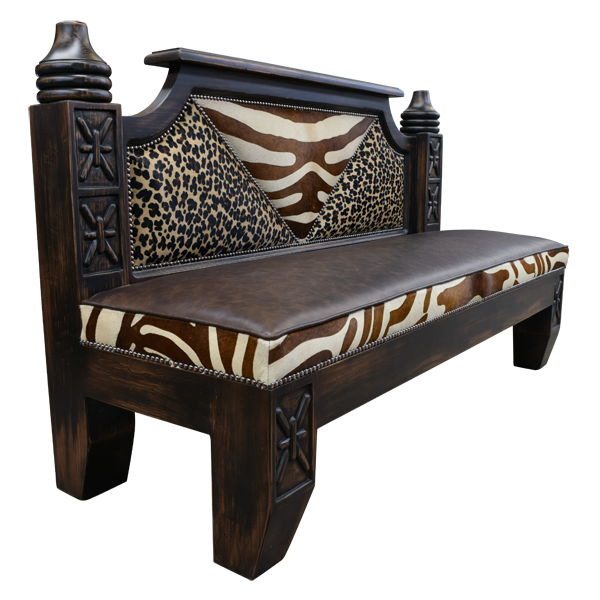 Bring a little of Africa into your home décor with the innovative design of this exotic, handcrafted settee. The settee features a fabulous, solid wood, rectangular seat back. The top of the seat back has a beveled, straight design that curves downward and connects with the solid wood uprights. The top of the uprights are hand turned, and the front of the uprights are adorned with hand carved, geometric details. Embellishing the center of the seat back is a “V” shaped design, upholstered with magnificent, simulated, giraffe patterned, full grain leather. Each side of the “V” shaped design is upholstered with exotic, simulated, leopard patterned, full grain leather. The top of the comfortable, padded seat is upholstered with rich, brown full grain leather, and sides of the seat are upholstered with matching, simulated, giraffe, full grain leather. All of the upholstery is precision hand tacked to the frame with decorative, gilt nails. The seat rest on a solid wood base, and the settee is supported by beveled, solid wood legs. 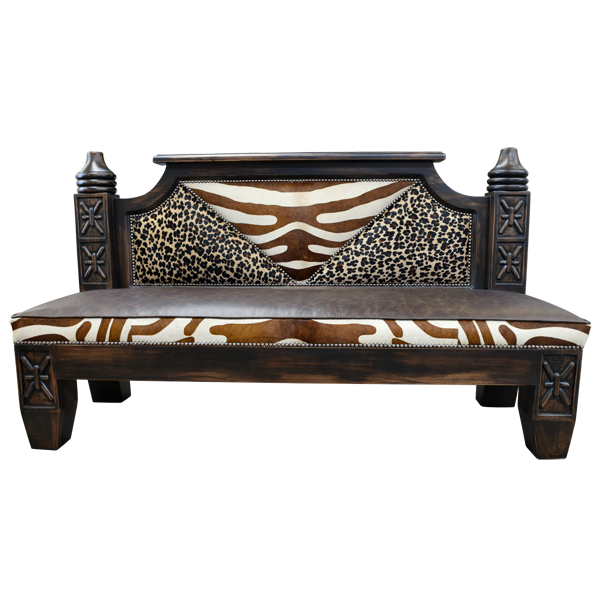 The front legs are enhanced with hand carved, geometric designs. The settee has a classic, dark finish, and it is made with the best, sustainable, wood available. It is 100% customizable.